Tis the season to pick Blueberries! Are you looking for something to do with all the blueberries? Well, look no further! I'll be honest, I'm not a fan of blueberries; my parents, on the other hand, can pick them off the blueberry bush and eat them right then. Me, the blueberries have to have sugar and other flavors (I don't even like plain blueberry jam). 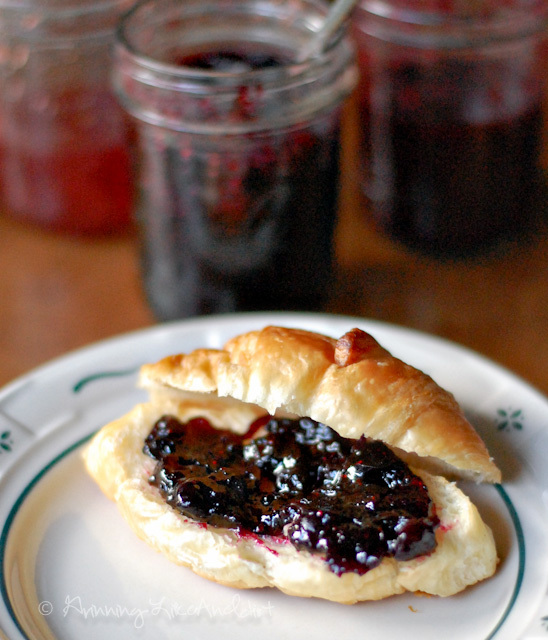 So when I came across Cinnamon Blueberry Jam recipe and read the rest of the ingredients, I had to give this recipe a try. I am not disappointed, as a matter of fact - I'll take this over Grape Jam/Jelly any day! 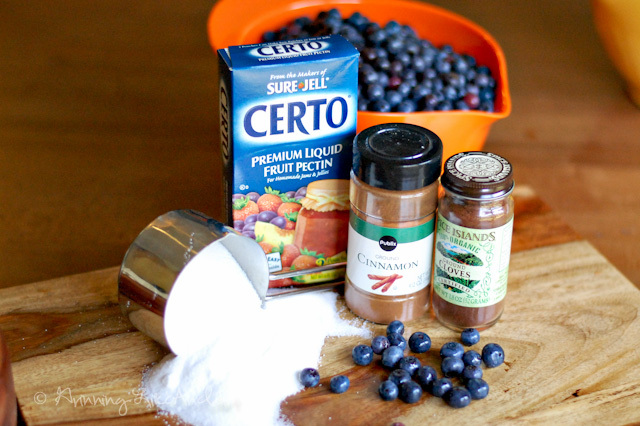 This recipe called for the Liquid Fruit Pectin, rather than the Powder Pectin. Not only does it have cinnamon, it also has cloves. We doubled this recipe which is why you see two tabs of butter. I'm surprised how much I really liked making Jam and how easy it was to can. It's so simple - throw everything in, stir it over heat, after it starts boiling put the pectin in and boil another minute, then start putting it in jars, then enjoy the fruits of your labor all year! For full instructions go to a previous recipe for Strawberry Jam. 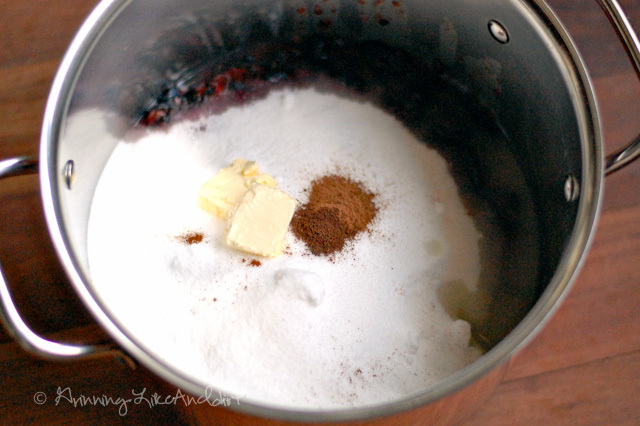 When we were cooking it, the smell of cinnamon, sugar, and cloves wafted up and put a smile across my face. (I didn't chop the blueberries down too much). Pulse blueberries in food processor until chunky (they'll cook down). Measure 2-1/2 cups and place in a large saucepan. Add the sugar, lemon juice, cinnamon, pinch of salt, butter and cloves. Bring to a rolling boil over high heat, stirring constantly. Quickly stir in the pectin. Return to a full rolling boil; boil for 1 minute, stirring constantly. 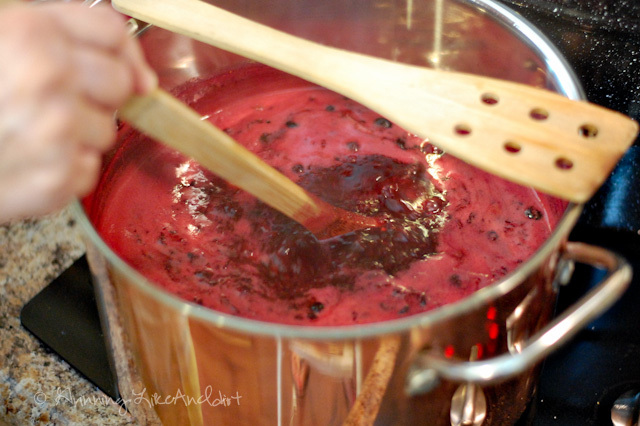 Carefully ladle hot mixture into hot half-pint jars, leaving 1/4-in. headspace. Wipe rims and adjust lids. Process for 10 minutes in a boiling-water canner.